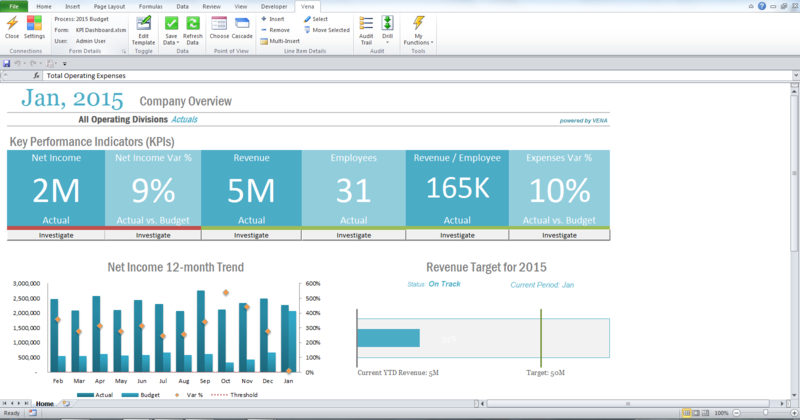 Vena is well suited for companies that have a population of users that are fairly adept with Microsoft Excel. Ideally, the company would also have an analyst who understands business intelligence, ETL, etc. Without somebody orchestrating the production, I doubt things would run very smoothly. Assuming there is somebody capable of running the software, the tool is awesome. Whenever we discuss investigating new tools, I always say the same thing, "If we switch to another platform, our users may have an easier time. That said, it feels like we can literally do ANYTHING with Vena." It can get cumbersome to have separate sheets for all prepaid expenses. The software works out very neatly - but creating a new sheet for each prepaid expense can be difficult. Because of this, I feel like forecasting is less based on actual plans, and more based on gut feelings, and trends rather than actual plans. I wish OfficeConnect could pull individual lines rather than just aggregated data. The example that I'm trying to work on now is that I would like to pull personnel information from OfficeConnect (mainly pulling lists of employees, or open positions). I don't know how to do that currently. I can pull aggregated data and show totals - but I can't see the individual lines that make up that total within OfficeConnect. At this point we have set up our reporting to integrate with Adaptive. We have spent some non-recurring money to set up and populate the system. Switching at this point would only be an option if we were unhappy with the decision. This might seem like I am side-stepping the issue but I think an important point is being made. Whatever system you decide to go with, changing later is costly and unproductive. We chose Adaptive and have absolutely no regrets. We are currently at a crossroads here at Teachscape and are looking at several different potential options. If we were still relying on a 20 to 40 sheet Excel workbook with thousands of links and formulas, I don't think I would be able to sleep at night. Adaptive gives me a greater level of comfort. Menus are easy to navigate, sheets are straightforward and flexible and you can work on your budget/forecasts without being at the office. The cloud based system makes it easy for users to complete their processes offsite and without needing there work provided computer. Creating new reports using both the web based Adaptive tool and OfficeConnect is quite simple with very minimal training. For us, it came down to Adaptive Insights and Host Analytics. The benefits seemed very comparable. We ultimately decided on Adaptive Insights because it cost less to implement and the time to implement was less compared to Host Analytics. We are VERY happy with our decision to go with Adaptive Insights. We spent about a year and a half in the selection process for our budgeting system. The issue that we kept coming across was speed, flexibility, and a lack of understanding of our process during the sales cycle. Most of these other products wanted us to change our budgeting process to fit their system rather than solving for our individual needs. Vena Solutions’ sales team had worked with other products (many of those listed above) before making the switch to Vena and as such were able to explain the differences and understand the frustrations with the other products. During implementation, our consultant understood our rather complicated processes and calculations easily. This product is extremely flexible and very easy to use and we can't wait to see where it takes us! 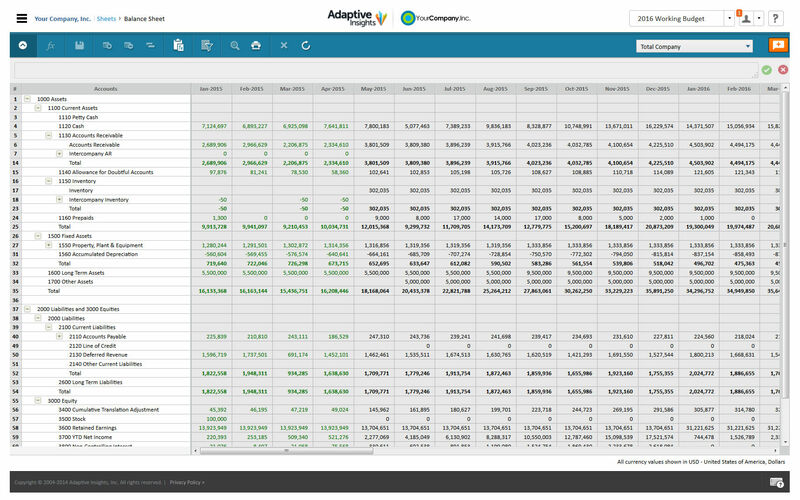 Our budgeting and forecasting cycles are now faster, more accurate and can evolve dynamically throughout the process. This is especially important in our business which is experiencing rapid growth. Our ability to push out bespoke reporting to business owners has massively improved. For our most recent budget cycle, we were able to simply and quickly illustrate the impact of foreign exchange fluctuations to our board. Vena Solutions has definitely increased employee efficiency. Spreadsheets that we were spending days preparing and reformatting are now updated within a matter of seconds. Vena Solutions has also provided more data integrity. We were doing a lot of manual data entry and copy and pasting from Excel. Since moving to Vena Solutions this is not necessary, hence our data integrity is much higher.